Please remember: We’ll never call you and ask for your passcode, password, PIN or PINsentry code. A phone scam is when someone calls pretending to be someone else, such as the police or your bank. They do this so that they can trick you into revealing personal details, withdrawing money or transferring money to a fake account. Always stay alert when someone you don’t know calls you – no matter who they claim to be or what number is showing on the caller display. If in doubt, call back on a phone number that you know is official. You can usually find this on the company’s website or on your statement or bills. Treat all unsolicited calls with caution. Remember, banks and the police will never contact you to ask you to transfer money, buy high value goods, or hand over cards or money. A text message scam is when someone sends you a text asking you to call a telephone number, click on a link or to send security details. The message might appear to be from Barclays or someone you trust because fraudsters are able to spoof genuine telephone numbers to hide the true identity of the sender. If you’re unsure, get in touch with us using the number on the back of your card. An email scam is an unsolicited or trick email designed to make you hand over money or reveal personal details. Stay vigilant when emailing – especially if you’re sending people personal details or organising financial transactions. A distraction scam involves someone trying to distract you while you’re at a cash machine in order to get your PIN, card or money. Click "My Profile" in dashboard. *Password must be 7-16 characters and can include specials characters with the exception of (. , - | \ =) or spaces. How do I report a password reset email request that I didn't make? Did you get a password reset email from TapUAE's that you didn't request? No need to worry about, your password link will always be sent to the registered email id. But we recommend you to change the password, to avoid unauthorised access to your account. I did not change my password, but got an email saying it was changed - what should I do? Immediately reset your password. If you see any unusual activity associated with your profile, please contact Customer Service at +971 0 000 0000. Below are basic tips to help you secure your computer and your personal information sent via the internet. Be skeptical of requests for account numbers, credit card numbers, or any other sensitive personal information. Please do not share sensitive personal information with anyone you do not know, especially if you suspect fraud. Do not reply to unexpected emails, telephone calls or text messages asking you for personal information. If you have any doubts about the legitimacy of an email and contact us immediately. Never share your log-in credentials for TapUAE.com with a third party including a financial institution or bank. Avoid reusing the same password for multiple web sites. Use complex characters (including letters and numbers). Choose a password that may be difficult for others to guess. Install recommended security and software updates for your computer or device. From time to time, review the security settings on your computer or device and adjust those settings to meet your needs. Look for a secure connection before sending personal information over the Internet. To confirm that your connection is secure, look for a locked padlock icon or the letters "https" in the address bar of your web browser. Although TapUAE.com uses reasonable security practices to help protect your information, we cannot guarantee that your personal information sent to or from TapUAE.com will not be accessed by or disclosed to an unauthorized party. When you are finished using our web site log out. Email support@tapuae.com to alert us about suspicious emails or calls. TapUAE will never ask you to provide sensitive information by email. We will send our administrative message directly to Tapper's dashboard. Phishing is the practice of fraudulently sending emails claiming to be from a legitimate person or business in order to induce customers to provide their personal information. Identity theft is the practice of a criminal using your personal information (such as name, address or credit card number) to commit fraud without your consent. Will TapUAE.com ask for my sensitive information by email? No; TapUAE.com will not contact you. We will send our administrative message directly to Tapper's dashboard. Can I unsubscribe from email and direct mail marketing communications? Yes, Every newsletter has a "Unsubscribe" link at the bottom of newsletter. When you click on that link, you automatically unsubscribe from our mailing list. For other email and notification, please goto setting section of TapUAE Dashboard. Can I contact you if I receive a suspicious email? 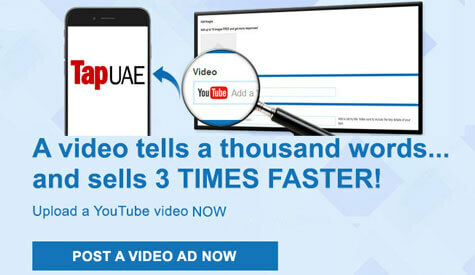 Yes; please send an e-mail to support@tapuae.com to alert us about any suspicious e-mails.